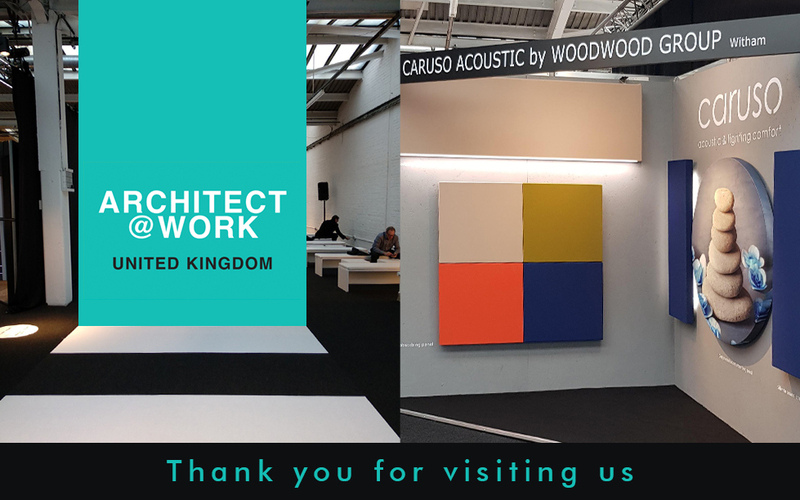 The seventh edition of ARCHITECT@WORK in London, which has seen the participation of Caruso Acoustic with the collaboration of the UK dealer Woodwood Group, ended with a great success. This year edition, transferred into the new site called Old Truman Brewery, in the Shoreditch district, had the future as main theme, or better the skill of being “future-proof”. In fact, the selected designers were asked to conceive projects that could be concrete answers to our time, in which change is measured in seconds, not years, and sustainability is a necessity not an ‘extra’. Architects and designers who visited the booth received Caruso Acoustic sound-absorbing products with great interest, in particular the possibility to customise them – shape and colour different combinations, integrated LED lighting systems and fabric print – as well as their versatility of use within the design sector. ARCHITECT@WORK is an exhibition with a strong international character, which can help building relationships among designers, architects and companies. An event full of workshops, conferences and meetings to follow developments in the design sector. For further information and details on Caruso Acoustic products download the catalogue here.